The City of Goodyear is a 189-square-mile West Valley community with 78,190 residents. Goodyear expects its population to grow significantly. These big city dreams and big city plans present both opportunities and challenges. One challenge relates to water: Goodyear never had direct access to its renewable supply of Colorado River water - until now. The Problem: Instead of river water, Goodyear has grown with a water supply pumped from its aquifers. The city has known for years that it cannot build a long-term water plan based on finite, non-renewable and state regulated groundwater. In addition to limits on groundwater supplies, groundwater pumped from aquifers in the Southwest Valley is extremely salty. The salinity level in one Goodyear well tested at one-third the salinity of ocean water. Living with salty groundwater has forced Goodyear to build the largest reverse osmosis water treatment plant in the state. The plant leaves behind 500,000 gallons of brine each day. While the plant is a necessary part of Goodyear’s water operations, the city has been looking at other options as it plans for future growth. Goodyear has an allotment of renewable Colorado River water, but the city has never built a system to transport and treat the water for drinking. Instead, the city has been storing some of its Colorado River water in underground or “recharge” facilities. Storing the water in aquifers outside its city gives Goodyear a limited right to pump and deliver a roughly equivalent amount of water in the city. Arizona law also allows cities to use a limited amount of “native” groundwater. For Goodyear, this comes out to 13,191 acre-feet of water per year. (One acre foot is enough to serve three average Arizona households for a year.) Goodyear estimates that it will approach that limit by about 2020. Goodyear understood that it had to get its full allotment of Colorado River water into its city, build a plant to treat the water, and curtail its groundwater pumping. Goodyear’s first challenge was to find a way to bring its Colorado River water into the city. The Central Arizona Project (CAP) operates a canal that delivers Colorado River water to the Valley, but the canal is 35 miles to the north and 45 miles west of the city. Building a water pipeline from the CAP canal to the city would cost $200 million and require expensive easements either through other cities or along Interstate 10. The Salt River Project (SRP) provides water to cities in a nearly 400-square-mile area of the Valley. This service area was defined more than 100 years ago by the farmers and ranchers who offered their land to the federal government as collateral for financing and building the Roosevelt Dam on the Salt River. Roosevelt Lake is the largest reservoir in a system of reservoirs and canals that brings Salt and Verde River water into the Valley. Property within SRP’s service area is called “on project” land. Goodyear is just outside of the area served by SRP or “off project” and has no access to SRP water or its canals. Just next door to Goodyear, the City of Avondale is within the SRP service area. The SRP canal that brings water to Avondale is 5 miles from Goodyear. 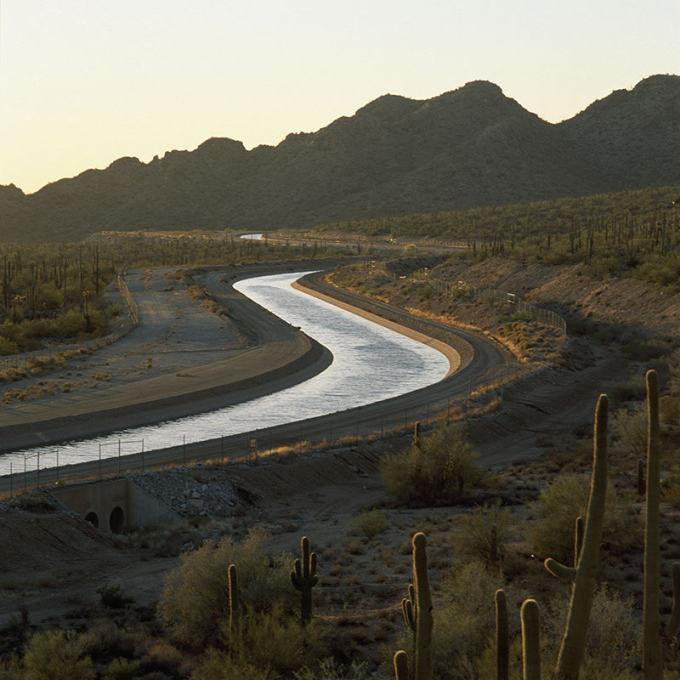 SRP’s delivery system intersects with the CAP canal near Granite Reef Dam in the East Valley. This means it is possible to transport CAP water through SRP’s canals. To address Goodyear’s challenge, the Salt River Project (SRP) recently agreed to convey Goodyear’s share of CAP water in its canals as far as Avondale and, from there, Goodyear will build a pipeline to a new drinking water plant. This is the first time SRP has agreed to convey Colorado River water for an “off project” city. Now that Goodyear will have access to its Colorado River water, it will proceed to build a short pipeline from Avondale to Goodyear’s new drinking water treatment plant. Phase I of the project is estimated to cost $110 million. Impact fees, new growth, and construction sales taxes are expected to fund about 75 percent of the costs. Operational changes in the city’s water system will pay for 20 percent, and 5 percent will be covered by existing water rates. Goodyear expects to be treating and distributing Colorado River water in the next three to five years. Finding creative solutions to challenging problems is a hallmark of the Valley’s water providers. Goodyear’s innovative project is just one more example of how the AMWUA cities work to find solutions every day to provide reliable and clean water to the Valley’s homes, businesses, and communities.